In a large bowl, combine the flour, 2 teaspoon sugar and salt; cut in shortening until crumbly. In a small bowl, combine 1 egg, water and vinegar, gradually add to crumb mixture, tossing with a fork until dough forms a ball. Divide into seven portions. On a lightly floured surface, roll each portion into a 7-inch square. Place an apple on each pastry square; place 1 tablespoon butter in the center of each. Combine cinnamon and remaining sugar; sprinkle over apples. Bring up corners of pastry to center; pinch edges to seal. Beat remaining egg; brush over pastry. Place in a greased 13-inch x 9- inch baking dish. Bake at 350° F for 15 minutes. Meanwhile, in a large saucepan, combine the sauce ingredients. Bring to a boil; cook and stir until smooth and blended. Pour over apples. 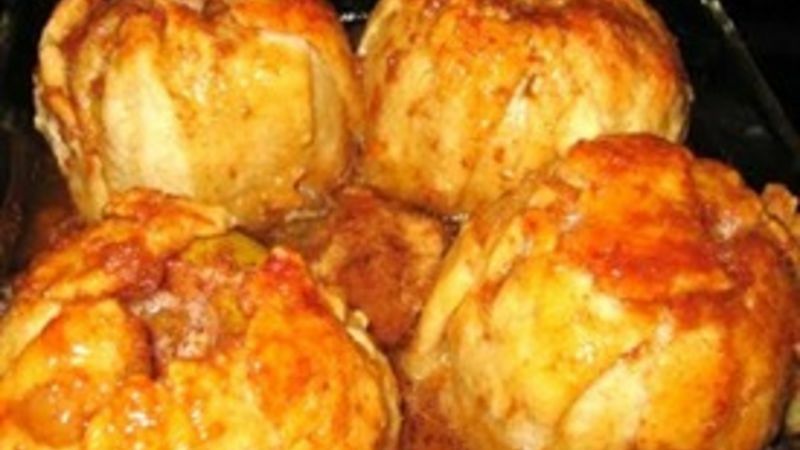 Bake 35-40 minutes longer or until apples are tender and pastry is golden brown, basting occasionally with sauce. Serve warm.